Wash the raspberries and arrange them in the bottom of a small cup. Set aside a few raspberries for garnish. Cover the fruit with the yogurt, emptying most of the tube to form a layer of Go-GURT®. Leave a little in the tube for garnish. Top with a layer of Trix™ cereal, and a few of the reserved raspberries for garnish. Cover with any remaining yogurt and enjoy immediately. You can use any of your favorite fruits, such as strawberries, blackberries or mangoes. The combination of Go-Gurt® and Trix™ is so good, it goes well with any fruit! 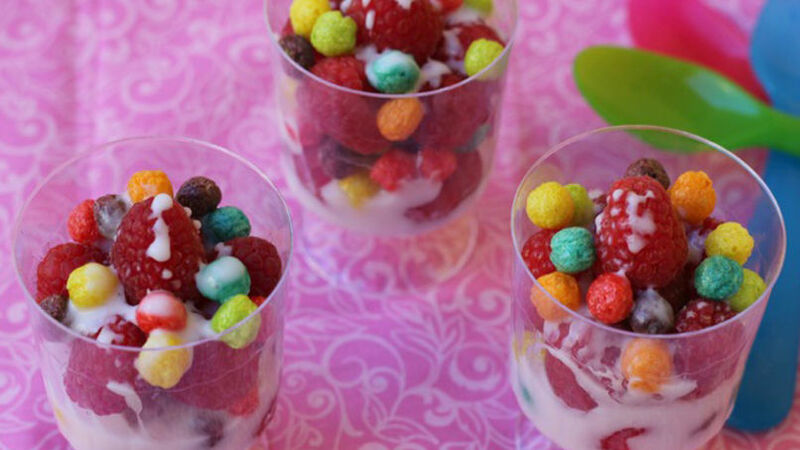 Your kid’s breakfast should be nutritious, yet fun; an easy feat when you invite your kids to prepare these fruit, yogurt and Trix™ cups. That’s what I did when my daughter, out of nowhere, lost interest in raspberries. I taught her how to make her own cup, starting with a fruit base and alternating layers of cereal and her favorite Yoplait Go-Gurt™. Now, breakfast is drama-free and she eats with gusto! Be inspired and try these flavor combos in the kitchen. Invite your little ones to become their own breakfast chefs!